The Gefen GTB-MHDMI1.3-441 is a Mini 4x1 Switcher for HDMI 1.3. The Gefen ToolBox 4x1 Switcher for HDMI 1.3 is a compact and lightweight alternative to rack-mounted HDMI 1.3 switchers. It allows up to four set-top boxes, DVD players, or other HDTV devices to be connected to one HDTV display. When two or more switchers are connected together, they can be used to support many more hi-def sources such as Blu-Ray players, satellite set-top boxes, and all types of HDMI displays. Features include support for hi-def, deep color resolutions up to 1080p@60 Hz combined with advanced lossless digital audio formats for pristine sound reproduction. Connects four HDMI sources to the 4x1 Switcher for HDMI 1.3's input using the supplied 6-foot HDMI cables. Connect an HDMI-compliant display to the HDMI output using an HDMI cable. Once connected and powered, the source signals can be selected and switched to display simultaneously. Question: What does the remote look like and can it be synced with a Logitech remote? 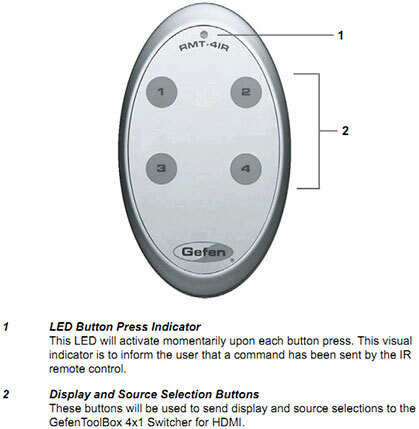 Answer: We have uploaded a picture of the remote and a copy of the manual for your convenience. As far as syncing with a Logitech remote, some users are reporting success with remotes that have the learn function. Others are experiencing difficulty due to different IR channels. There are dip switches in the unit and remote that control which IR channel is in use. These may need to be adjusted to match the universal remote.